New Delhi : Growing urbanization and increase in population has increased the exposure of people to airtight buildings with accompanying health impacts. With more than 90% of time being spent indoor, the Indoor Environmental Quality (IEQ) plays an important role in maintaining the health, well-being, & productivity of individuals especially in urban areas. Indian Society of Heating, Refrigerating and Air Conditioning Engineers (ISHRAE) in collaboration with Society for Indoor Environment (SIE) and Indoor Air Quality Association-India (IAQA) organized the first “Asian Conference On Indoor Environmental Quality” (ACIEQ) today at Indian Aviation Academy, New Delhi. “In India, the numbers of cities are slowly increasing so the idea is not only to make it Delhi centric but a pan India approach. Air pollution is much more of a health issue now specially for old people and children. We need to ensure that we start working on national clean air program. It’s not only the government initiative our society who comes together to work them”, he added. 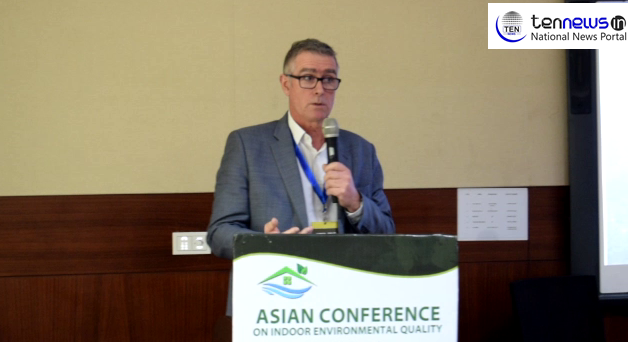 Major Themes that were covered in this Asian Conference were: “Indoor Air Quality for Urban Living’, “Adaptive Thermal Comfort” and “Occupant Performance and Behavioral Studies”. ISHRAE with 42 chapters all across India, having more than 12,000 members and 10,000 student members has been working relentlessly on promoting Indoor Environmental Quality (IEQ) and has already come up with IEQ Standard which has been well received internationally and has been adopted by the Indian Green Building Council (IGBC). First Asian Conference on 'Indoor Environmental Quality' held in Delhi!